Yellow goatsbeard is a biennial or perennial plant; the slender, fleshy taproot produces a light green, succulant stem from 1-3 feet high, containing a bitter milky juice. The alternate, grasslike, clasping leaves have curled margins and taper to long pointed, backward-bending tips. The stem bears a solitary yellow flower head with ray flowers that unfold early in the morning and close up at midday. Other varieties: Purple goatsbeard or salsify (T. porrifolius) is a related larger species with uncurled leaves and purple flowers. It is perhaps more widespread than yellow goatsbeard, since it is often cultivated for its edible, oyster-flavored root. The root also has some diuretic properties, but they are weaker than those of yellow goatsbeard. Aruncus dioicus is also called goat’s beard. Grows in pastures, fields, meadows, and waste places of Europe, from where it has come to be naturalized in southern Canada and the northern part of the United States. There is another herb that is called goat’s beard (Aruncus dioicus) of the Rose family. 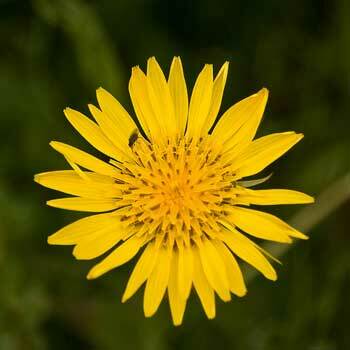 Other than having yellow flowers, this herb has no similarity with Yellow goatsbeard (Tragopogon pratensis) or Salsify (Tragopogon porrifolius). Salsify (T. porrifolius) is sometimes spelled “salsafy”. Grown as a potherb for its roots. Harvested, stored and cooked much as carrots or beets. 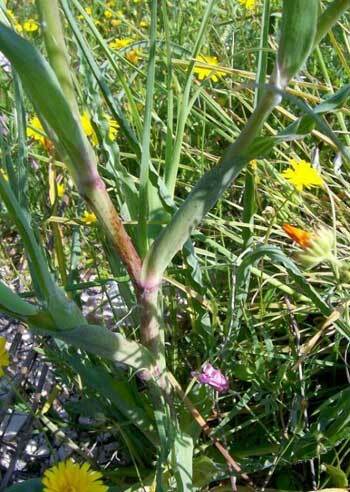 Salsify or oyster-plant, yields a juice, that when chewed is said to aid digestion. Primarily used as a remedy for urinary and water-retention problems, the root decoction has been used for lack of appetite, heartburn, and digestive difficulties.